Not the best photo, but the best I could do under the circumstances. (Did you know that it takes *six* weeks for a cracked tailbone to heal?) As you can see, I have been having a great time with this sweater. I can't recall ever having knit the back of a sweater so quickly. And while this isn't on tiny needles, it's not on tree trunks either -- good, respectable US 8's. Obviously I'm enjoying the knitting of Butterfly quite a bit, but I have to say that I'm also enjoying the pattern. Unlike the error infested Lavold pattern, this one seems free of problems so far. (I did make a bit of a change on the decreases where you switch from the chevron pattern to ss, and if you are making this sweater, feel free to ask me about it.) The only problem I have is lack of schematics, but that seems to be a problem across the board with many of the major knitwear designers. grumble. . .
p.s. 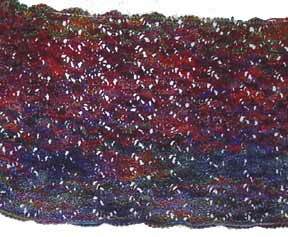 - I just shot a quick note to the Jane Ellison website people asking for errata for the Noro Knits book. If I get any replies, I'll post them here! That's Butterfly from Noro Knits. Isn't it pretty? This is the first design in a long time that I have fallen in love with. Just ask Pete, I was literally waiting by the door for UPS to arrive! I worked diligently on it all weekend and I will have some progress to show tomorrow! New to me, at least. I have received a few books in the last couple of weeks and I thought I'd give them a mention. First up is Domino Knitting by Vivian Hoxbro. Now this little book has been on my mind for a long time, but it was not until I saw Theresa's little Koigu domino squares that I knew I had to have it. And while I haven't had a chance to play with the technique yet (as I only received the book yesterday), I like what I see inside. There are lots of small projects so you can "Learn While You Knit" as chapter one is aptly named. But Vivian doesn't stop there. Once you have mastered her technique, you can try out one of the larger projects in the second half of the book. And I'm impressed with the variety. Everything from pillows and scarves to handbags and shawls. I'm sure you'll be seeing some domino's on my blog soon! Next up is Color Works: The Crafter's Guide to Color by Deb Menz. Now this one was on my wishlist for a long time, but Amazon was selling it at full price -- $24.95! So, I patiently waited and they finally marked it down (30% -- or $17.46). Luckily this happened just as I was wanting the Hoxbro book. Now I purchased Color Magic for Quilters years ago (when I thought I was going to be a quilter -- ha!) and just loved it. Deb Menz's book takes the exploration of color a step further including a color wheel and punch out color harmony guides. Nifty! I also like the fact that she really gets into explaining color. I think I'll be reading this book from cover to cover. I imagine that it will be a huge help with my dyeing and spinning experiments. Finally we have Donna Kooler's Encyclopedia of Crochet. I *love* this book. Lately I've been wanting to experiment with crochet a little more, but I don't even really know the basics. This book is excellent at teaching the basics and SO much more. It has step by step illustrations for both right and left handers for all kinds of stitches. There are a bunch of patterns (a couple that I may even try out) and a pretty good selection of stitch patterns (164). I just keep picking it up an paging through it. If you are interested in learning more about crochet, I would recommend it! So, there you have it. Three books and I am happy with all of them. Lest you think I like every knitting book that I pick up, believe me, I've seen some that I am not at all impressed with. However, my Mom always used to say -- If you can't say something nice, don't say anything at all. My best advice when purchasing knitting books (since there are now *so* many new ones coming out), try to check them out from your local library first. Or browse them at the local B&N and then hunt for deals online. It is very rare that I ever pay full price for a book! Yesterday was a bad day. A long day. 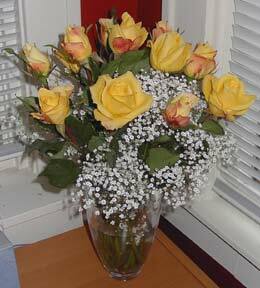 Luckily I have a very understanding husband who came home from work with these beautiful roses for me. Now these cheery roses are sitting on my desk and brightening up this dreary day. Not much knitting to report since I spent my free time getting caught up on assembling patterns. But I did buy myself a (yarn) present which will be arriving in a few days! I'm hoping it's here before the weekend! Look what I got from my Secret Pal! Gifties! Thank You SP!!! She sent me a really great handstamped card which is really cool as far as I'm concerned since I own a rubber stamp store :) She also sent some Shrek band-aids to make me smile because of my boo boo (falling down the stairs). I think my daughter will be inventing a need for one of these very soon. At her age any little scrap or mark is need for a band-aid. There was also the cutest Pinocchio tape measure in the package. I love tape measures and can never have enough! And there was some wild Plymouth Outback Mohair in the package too. I noticed that it has the same yardage as Cascade 220, so I'm wondering how a felted bag made from the two carried together would look. I bet it would look super fuzzy. I've never felted with mohair, so I'm very interested in what it will do. Thanks again Secret Pal! One other thing -- there was a post card in the package too. My Secret Pal was just down in S.C. on vacation which is weird because so was I. Did the hurricane miss you SP? I was on Hilton Head Island and it missed us altogether. Whew! So, you would think that falling down the stairs and messing up your back and tailbone would lead to hours of lounging around in bed knitting. Not so. I could not get comfortable for two days and ended up sitting at the computer working for the most part. Business at my rubber stamp store -- www.stampingonline.com -- has been very busy because of the release of the Winter Hero Arts stamps. And Black Sheep Bags is adding new stores all the time (2 or 3 this past week alone!) It took me so long to do the simplest tasks, that not much else was accomplished. 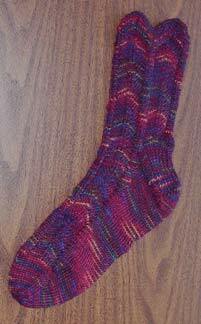 So, it ended up taking me two days to knit the toe of my first Broadripple -- that's from Rob's pattern. 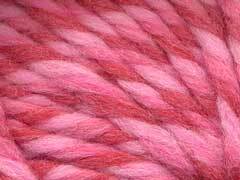 I'm using Mountain Colors Bearfoot in color Wild Raspberry -- so soft and pretty! Last night I was feeling a little better and got in a few rows on my Keepsake. Maybe tonight I'll move on to color #6 in the Keepsake! I think I'm only 2 rows away. Blog-iversary -- Happy Blog-iversary to me! It's been two years since I started my knitting blog! Near Miss -- I just got back from a wedding down on Hilton Head Island, SC and I'm happy to report that hurricane Charley was nice enough to jump out into sea before it reached us. The hurricane didn't turn back inland until about 100 miles north of us. Isn't that lucky? We had a lot of rain, but it stopped long enough for the ocean side ceremony. A Fall -- I fell down the stairs. How stupid do I feel?!? Last night after a long day of catching up on work that piled up while I was gone, I headed downstairs for a rest and slipped on the two stairs leading from my office to the landing. I couldn't even move for about 20 minutes maybe. Ugh. I hit my back on the top stair and landed squarely on my tailbone on the edge of the bottom stair. At least that's what I think happened. It all happened so fast and I almost passed out, so I don't really recall events all that well. I'm in pain today, but I can walk -- very slowly. I can't believe that I fell down the stairs!! In knitting news, I resumed work on my Broadripples while on vacation, but didn't get very far. We had lots of events to attend for the wedding, so there wasn't much knitting time. I'm off to bed to rest up my back. Hopefully I'll get a little knitting done. Well, I made it to color #5 on the Koigu Keepsake Shawl and I'm still loving it! If you made Charlotte's Web like I did and loved it as much as I did, then I would highly recommend the Keepsake. However, I want to give you a bit of advice first to save you confusion and worry. You may run out of the first few colors. In fact, I didn't have enough to complete the correct number of rows in the first three colors (snowball effect -- not enough of color #1 -- use color #2 to fill in which leads to running out of color #2 early and so on. . .) But do not worry! Just make do and with all the colors and blending going on, I doubt that you will even be able to tell when you look at it a few rows later. Keep some kind of record so that you can pick your Keepsake up at any time and know exactly where you are at. I have a sheet of paper with the row numbers followed by the pattern row # and color #. I check off each row and then I know exactly where I am at. I find that this is the biggest problem with a pattern like this. If it takes you 10 minutes just to figure out where you are at, you are less likely to pick it up to do a single row. Well, that's my Keepsake advice. I hope it helps someone out there! Now go out and buy some Koigu and get knitting! In an effort to try to get more rest, I have been reading and knitting (and sleeping) a little more in the last week than I'm used to. And as you can see, I finished the Diadomina scarf. 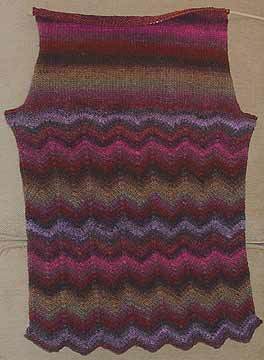 As I mentioned before, I used the Multidirectional Diagonal Scarf pattern by Karen Baumer and I really liked it. I loved the fact that there was only a simple patttern to remember and no counting to do. It was perfect for the car ride up to my in-laws last weekend and great for sitting-on-the-couch-feeling-ill knitting. What a great pattern Karen! I also finished a couple of rows on the Keepsake, but I'm not taking a picture again until I start working on the fifth color. I finally worked out a "system" for remembering the row and color that I'm on, so now it's easy to just do a row or two and put it aside and then easily pick it up again and know exactly where I'm at. And about the reading that I've been doing. . . I love to read about science and I found a great book! It's called The Elegant Universe: Superstrings, Hidden Dimensions, and the Quest for the Ultimate Theory by Brian Greene. In it he explains superstring theory which is a unified field theory that is promising to unite the seemingly disparate ideas of general relativity and quantum mechanics. I'm still in the early chapters of the book in which he is explaining relativity, and the thing that amazes me is that he is making it easy to understand! I'm still making my way through Anna Karenina too, but I've been so fascinated with the Brian Greene book that I have really neglected her. 1. Are you a yarn snob (do you prefer high-end/natural fibers)? Do you avoid Red Heart and Lion Brand? Or is it all the same to you? Hmmmm. . . I guess I am. I'm not above using a little Kitchen Cotton to make a washcloth or something, but I generally prefer higher end stuff. I am a Koigu addict & I love Alpaca and Angora. 2. Do you spin? Crochet I do spin on both a drop spindle and on my Ashford Joy. And I'm learning more about crochet. I have Donna Kooler's Encyclopedia of Crochet coming from Hamilton Books, but I could always use another good book on crochet. 3. Do you have any allergies? (smoke, pets, fibers, perfume, etc.) *Highly* allergic to smoke. Somewhat allergic to cats and dogs that aren't my own. Floral perfumes bother me so I stick to scents like citrus and natural herbals. 4. How long have you been knitting? Gosh, since I was little. 5. Do you have an Amazon or other online wish list? I do have an Amazon Wishlist and there is a link over in the sidebar. 6. What's your favorite scent? (for candles, bath products etc.) Like perfume, I stick to cirtus and herbal scents -- nothing floral. 7. Do you have a sweet tooth? I love chocolate! Especially dark chocolate or chocolate with coffee/espresso beans. Mmmmmm. . . now I'm thinking about Scharffen Berger Chocolate. I also love coffee and green tea! 8. What other crafts or Do-It-Yourself things do you like to do? Hmmm. . . knitting keeps me pretty busy now a days. 9. What kind of music do you like? Can your computer/stereo play MP3s? (if you want to make her a CD) Husband keeps me in CD's and I don't have an MP3 player. 10. What's your favorite color? Or--do you have a color family/season/palette you prefer?I love red and I would say that I'm in the autumn color season. Olivey greens, browns, reds even oranges appeal to me. 11. What is your family situation? Do you have any pets? Married with a 3 yr old, 2 cats and 2 fish. Not sure if that helps you any, but maybe it will give you a start. Can't wait to hear from you! And now I should really go join the Secret Pal ring. I feel like I haven't gotten anything done with all this medical ridiculousness that 's been going on! For at least a month and a half now, I have been suffering from ear pain. I've been to the doctor and gotten antibiotics, decongestants and other things. Nothing worked. Finally I decided to look around for a solution myself and I found that my symptoms indicated a TMJ disorder. Strangely enough, when I got through to my doctor's office and told the nurse my symptoms (not mentioning TMJ at all) she spoke with the doctor who said he thought is was a TMJ problem. Hmmmm. So, now I am on an anti-imflammatory medication. I'm eating lots of soup and trying to rest my jaw, but the pain has been intense for the last couple of days and it's really exhausting.